6ha of mature, sheltered, parklike surrounds in Sandy Point Domain. Close to Oreti Beach, take a stroll and view a beautiful sunset. Cast your memory to one of the movie locations for the World's Fastest Indian along the flat sandy beach. Catch the right tide and fall asleep to the sounds of the waves. Enjoy some whitebaiting or trout fishing on the Oreti River. Try out local horse trek adventures. Listen to native birdlife while enjoying local native bush walks. Take a night off and walk through to Cabbage Tree Restaurant and Function Centre for a delicious relaxing meal. Cook a fresh NZ steak or a Southland roast lamb in our kitchen ovens. Enjoy the surroundings and atmosphere. Motorhomes, caravans, tents, cabins, tourist units, backpackers, family accommodation, group accommodation welcome. Awesome comfy bed and beautifully clean cabin. Bathrooms are fabulous. Will be back. Closest Holiday Park to beach. Otatara is a hub of activities suitable for all people, beautiful natural environment. 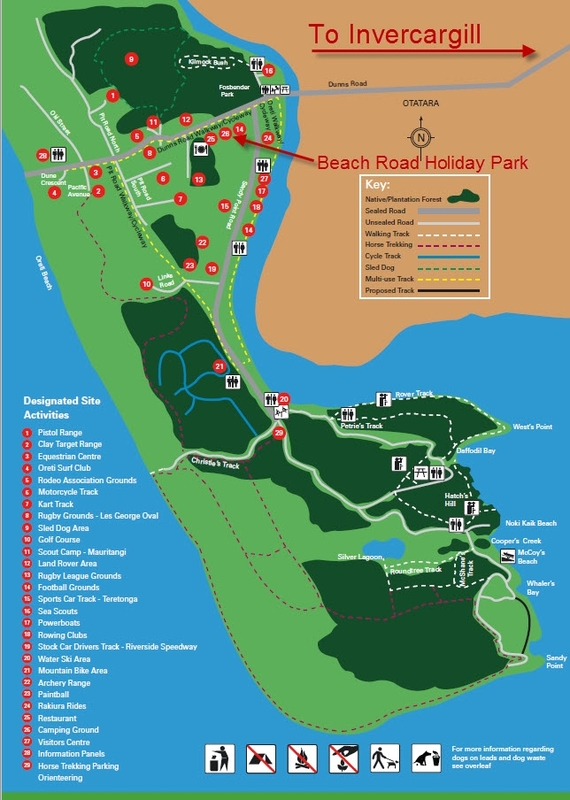 Beach Road Motor Camp is situated at 375 Dunns Rd, Otatara, Invercargill, New Zealand. Find our contact details here and see our interactive map for details on our location and how to find us in Invercargill.